Two people who eat bacon and love Discovery meet, marry, and have a baby. Both Mike’s and Michaela’s birthdays are behind us now, as is Christmas. Honestly, I don’t know where the time goes! Mike requested Korean BBQ for his birthday, so Michaela and I gladly indulged him. We were too busy eating to snap any pictures, but I think (I hope!) Mike started 42 off right. As for Michaela, she had a looooong birthday celebration. The weekend before her birthday, we hosted 10 of her friends at Cerami Cafe, a place where you can paint your own ceramic figure. The girls had a blast painting and then we had pizza and an amazing cake Mike and Michaela made from scratch. 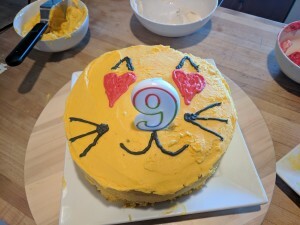 It looked like a cat emjoi with heart eyes, and when Mike cut it, the girls literally squealed because take cake inside was blue and purple swirls. On her actual birthday, Mike was out of town. As I posted on Instagram, I was really worried about how her actual birthday would be. She’s a huge daddy’s girl, and every time her birthday came up in the weeks leading up to it, Michaela cried because Mike would be gone. I tried extra hard to make it a good day for her, making her requested birthday breakfast of chocolate chip-Nutella pancakes (and I *never* make pancakes!) 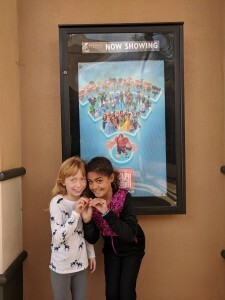 and taking her and her best friend to the movies. Heck, I even splurged on movie theater popcorn/soda/candy packages! After the movie, we wandered the mall and then had dinner at Fuddruckers. We’d never been there, but Michaela requested burgers and there was one at the mall, so that’s what we did. 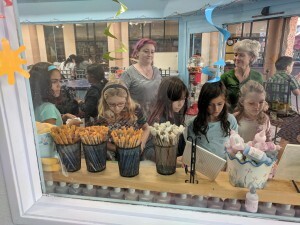 It had a small arcade in it, so the girls played after eating… Before we headed for frozen yogurt! It was hours and hours of fun, and that was before we got home and Michaela saw the helium balloons and presents I’d put around the house for her. By the end of the night, she was pooped, but had just enough energy to talk to Mike on the phone. It was a good day! And that wasn’t the end of the celebration. A couple of days later, we went to Corvette Diner, a local restaurant that Michaela really likes. She ordered a giant burger, we got her a balloon animal, and we listened to classic feel good tunes throughout our meal. The following day, Michaela finally opened her presents from her grandparents, and she spent the rest of the day enjoying them. Hard to believe she’ll hit “double digits” for her next birthday! 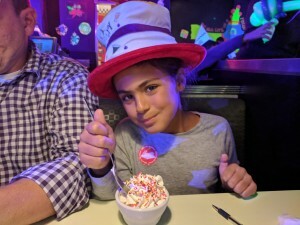 In less than a week, Michaela turns 9. NINE. How did that happen? 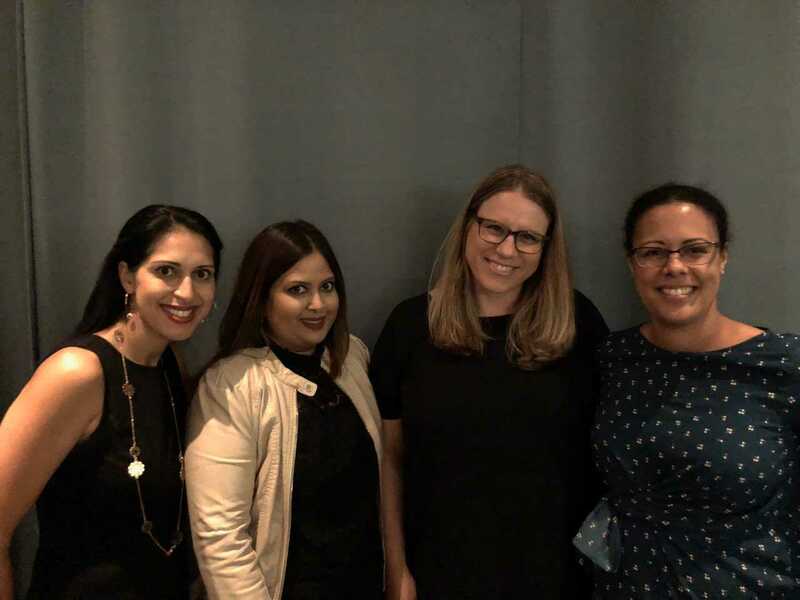 I remember being pregnant and people telling me, “the days are long but the years are short.” I sort of rolled my eyes at the hackneyed wisdom. Then I had a baby and learned how truly long the days can be, and now more and more I appreciate the truth about the years being short. In what seems like the blink of an eye, we’re at a place where Michaela is halfway through her childhood. 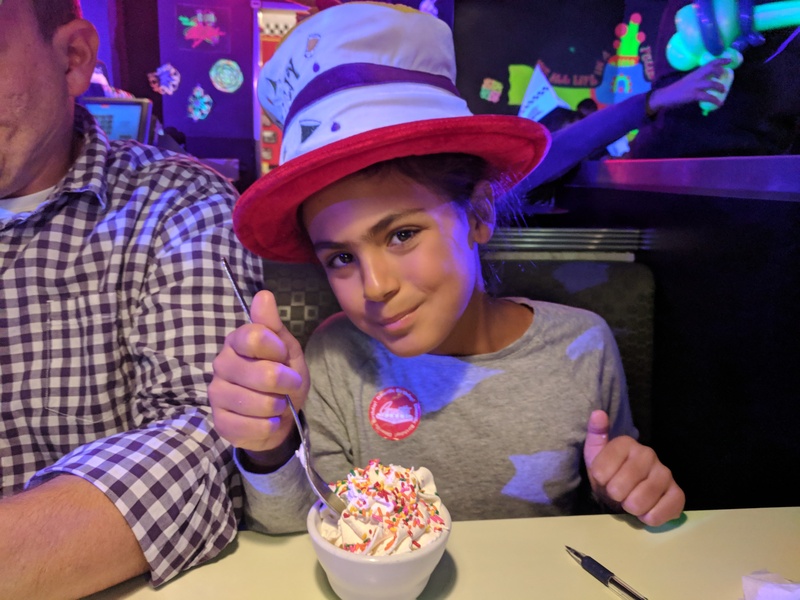 Halfway through the traditional amount of time a kid lives with their parents, halfway through the K-12 school experience, halfway through the time I have to impress upon her lessons that will serve her well for the rest of her life. Granted, some kids don’t go off to college and nowadays, many kids move back in with their parents if they do leave. And as long as Michaela is doing what she’s supposed to do — working or studying (or both!) and being a contributing member of society — there will always be a place for her with me. But still… This feels very momentous somehow. It’s also interesting to think: the remaining nine years will go by very quickly, so it’s probably time for Mike and I to start thinking about what we want life to look like once our nest is empty. My vote is we move our nest to Barcelona, but that’s just me. 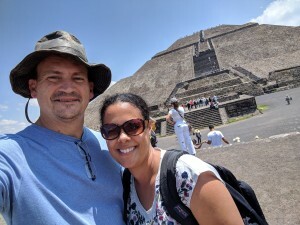 Mike and I belong to a service that finds international airfare deals, which is part of how we’ve managed to go to some interesting trips in the last few years. (For example, last year, we flew round trip to Japan, the three of us, for like $1,800.) In May, we got an email about cheap flights to Philippines and decided we’d go for Thanksgiving. I was excited because I love to travel, but also a little ambivalent because it was so random… and because it was a beach vacation and I don’t know how to swim and don’t need to tan! But I figured the worst that would happen was I’d sit on the beach reading while Mike and Michaela did water stuff, and there are way worse things in the world. Our lives have been very hectic since May, so we sort of put planning on the back burner. Mike always does our itineraries and he didn’t have it all nailed down until a week or so before we were scheduled to depart. It was a hard trip to plan! The Philippines are an archipelago of 7,000-plus islands and traveling from place to place often involves ferry rides. On the day in question, we drove up to LAX, taking advantage of our fancy credit card that gets us access to an airport lounge. The flight is 15 hours, so there was a lot of sleeping (or trying to anyway) before we eventually made it to Manila. Once in Manila, we went through immigration, got our bags, and then took a shuttle to the domestic terminal, to grab another flight. The crazy thing about the airport there is the terminals are basically in different areas of the city. To go from Terminal 2 to Terminal 4, we had to take a bus ride through the city on a shuttle with no doors! We stayed at the Quo Vadis resort for two nights. I was expecting there would be a lot of vendors walking up and down the beach selling trinkets, but there really weren’t (we only say two the while time we were on Philippine beaches), which would never happen in Mexico, for example. Quo Vadis had really beautiful grounds, with a big blue pool, stellar ocean views, and whitewashed buildings. Like everywhere else in the Philippines, there were some stray dogs, and we saw giant crabs (like the size of my fist) each night skittering around the sidewalk after it got dark. Moalboal itself was pretty sleepy, at least while we were there. It was gray and a little bit drizzly due to the typhoon, but our last day it cleared and was sunny and hot and I could imagine the place being even more amazing. We took a tricycle (a motorcycle with a sidecar bolted onto it) to Kawasan Falls one morning. I surprised myself by getting in the (cold!) water and wading out before Mike or Michaela. I was trying to be adventurous and break out of my comfort zone! (I also ate a few bites of fish and tried fried pig knuckles, so I would say it was a success.) Michaela was super brave, too– she went out to under the falls! Our last morning in Moalboal, we took a trike to the famous White Beach, which was exactly what the name implies. The water was soooo clear and warm. There were schools of fish swimming by, and coral in the water, and shells everywhere. I didn’t wear my bathing suit (stupid me!) so I sat on the beach and read (are you sending a theme) while Mike snorkled and Michaela played on the water. Then it was back to Cebu City. Mike and I both agree it’s one of our least favorite cities we’ve been to. A ton of traffic and really bad smog, plus trash everywhere. Speaking of ubiquitous Philippine sights, I have never seen so much livestock in my whole life! I saw hundreds of roosters, many of which were for cockfighting (we passed a number of cockfighting rings in various cities), plus pigs and cows and even a couple of water buffalo. And the roosters crowed all. the. time. Day and night. From Cebu City, we headed back to Manila. I was actually really excited to spend some time there because of the World War II-related history, but the city was practically impossible to navigate! We literally waited two hours for a taxi before giving up and deciding to swim in the hotel pool instead. Uber used to be there, but they sold to a company called Grab that is a taxi-hailing app. We didn’t have great luck with it. It didn’t help that while our cell phones worked great in the rest of the country, neither Mike nor I could get online on our phones in Manila. So while our flight from Manila wasn’t until 9 p.m., we spent our day going to the amazing Art in Island 3-D museum, then wandered around the world’s 5th-larges mall, and headed to the airport early. I am incredibly glad we visited the Philippines. The beaches were beautiful and we really enjoyed our time relaxing on the shore and in the water. If we’d had more time, I would have enjoyed visiting even more of the country’s various islands and taking in the different sights. That being said, as is the case in so many places, we also saw heartbreaking poverty. Homes made of flimsy scrap metal with no indoor plumbing, people washing clothes at communal open taps. Kids with tattered or no clothes. Lots of public urination. I spent a lot of time talking to Michaela about how lucky we are that we happened to be born where we were and how much we have compared to most people in the world, and working on her to say thank you in Tagalog to show our heartfelt appreciation for people’s service. I hope those are lessons that will stay with her as much as her memories of holding a starfish and collecting sand dollars and drinking fresh pineapple shakes. Because we really are incredible fortunate. I chaperoned a Girl Scouts camping trip. It was basically hell on earth. I’ll never make that mistake again. I won a couple of first-place awards from the San Diego Press Club. It’s always nice to have my work recognized by a panel of professional experts. I went to LA and saw Phil Collins in concert! My seat was in the nose bleed section, but he sounded really good and thanks to the monitors, I could mostly see. He performs sitting down now, so it’s not like he was weaving around the stage. His 17-year-old son is playing drums on his tour and the kid is freaking amazing. My aunt Jerry loved Phil Collins and gave me dubbed tapes of some of his albums (and Genesis albums) when I was a kid, so Phil Collins has a special place in my heart. 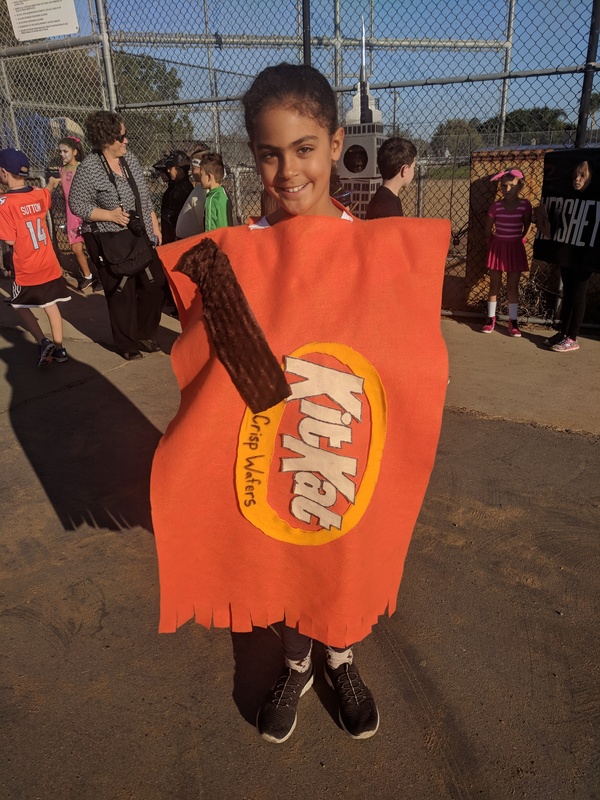 Michaela dressed as a Kit Kat bar for Halloween, breaking her fruit tradition. She and Mike made the costume together out of felt and it came out really well! I voted! There were some races across the nation that didn’t turn out the way I hoped (I’m looking at you, Beto O’Rourke, Stacy Abrams, Andrew Gillum), but it was a much nicer feeling than I had in November 2016. We went to the Philippines for vacation, which I’ll write about later. And best of all, the treatment my mom had for her liver cancer seemed to be successful in killing the tumor. She’ll have to go in for monitoring every three months, but for now, she is doing well and things are good. I have spent the last couple of weeks cooking dinners for my family. This came after I realized we were eating out sometimes as much as 5 or 6 nights a week, mostly due to poor planning and laziness. It’s not healthy for us, it doesn’t set a good example for Michaela, and it’s really expensive. Mike has traditionally done the bulk of our cooking, but he’s been working a lot lately, including a lot of nights out of town, so I though I’d pick up the slack. I follow a pretty healthy number of food blogs and am always bookmarking things that seem interesting, so I mostly have been going through my bookmarks to find things that sound good or work together (e.g., buy broccoli for stir fry, use the rest of it later in a pasta dish). It’s going okay, although I have to admit, a few days in, I was exhausted. Tired of cooking, tired of thinking about cooking, tired of washing dishes. I have mostly gotten over that for now. Some of the stuff I’ve made has been really good. Other stuff, only okay. I track it all in this Tumblr, where I add little notes about what I changed in the recipe, how everyone liked it, etc., so if you’re interested in my hits and misses, that’s the place to look. Last night, I made ravioli with sage, walnut and spinach brown butter sauce. The recipe called for store-bought ravioli, which got me thinking– does it really count as a “homemade” meal if you buy the major ingredient? Does it matter? Are my expectations too high as far as my nightly dinner making goes? Am I crazy to want to try different recipes all the time, especially since it kind of stresses me out to have to get home and get dinner ready? Would it be wrong to pull out a frozen pizza once a week? It’s still eating at home, but it’s… not “real” cooking. It’s not a contest. It probably doesn’t matter in the scheme of things. But it’s something I have been thinking about a lot since I started cooking dinners. Earlier this week, Mike was out of town and I had some veggies and an open jar of spaghetti sauce, so I decided I’d be lazy and we’d make pizzas on pita bread. Michaela was thrilled to get to top hers (she chopped up her olives so it looked like a spider), said it was the perfect amount of food, and she really enjoyed eating it. Maybe that should be enough? Who knew dinner was so fraught with deep questions?!? When I turned 35, I made a list of 40 things I wanted to do before I turn 40. I have been working on it little bit little, but there’s a lot to be done still. In fact, when I went through the list just after my birthday, I was feeling pretty good about crossing things off… until I realized that even with all the new stuff I’ve managed to accomplish, there are still 21 things left on the list to do! Mike and I got back from Mexico City on Sunday; Monday was my mom’s cancer procedure (short version: directing chemo right into the tumor, to shrink or kill it), which required an overnight hospital stay so I was with her Monday and Tuesday at the hospital; and Wednesday I was back at work, but offsite all day coordinating media stuff. Thursday was a normal day and then Friday, I flew to San Francisco for my 8th annual girls’ trip! The last few weeks won’t go down in anyone’s books as the best ever. We had a scare that my mom’s cancer had spread into her bones, but it looks like that’s not the case and so we’ll be moving forward with a type of targeted chemotherapy. My mom called me to let me know she’d made an appointment of Sept. 24 for the procedure, which requires 1-2 nights of hospitalization (depending on how she reacts to everything). I, in turn, let Mike know. And Mike replied asking if she could put it off by a day or two. I was floored. What a rude, insensitive thing to ask! She has been dragging her feet about having any treatment and she goes ahead and does it and he asks if we can move it? For what? I looked at the calendar and he was set to be out of town, but I didn’t see what that had to do with the procedure. “You’ll be out of town with me” he said. Well, as it turns out, Mike has been planning since July a trip for our 10th wedding anniversary. He worked with my secretary and my boss and his secretary to block three days on my calendar. He’s flying his mom and stepdad in to watch Michaela and he’s taking me to Mexico City for a five-day getaway. I sat at my desk and cried as he told me all that. I feel like basically since the end of July, I’ve been triaging my life, just dealing with whatever was most important at that moment or on that day and letting everything else slide, including (especially) taking care of myself. So for him to have planned this trip — a trip to a place I love, that I’ve been telling him for 10 years I want to take him to, to show him where I lived and went to school — it was just so thoughtful and sweet. And while I’d do anything for my mom, thinking we wouldn’t be able to go was a giant bummer, to say the least. I told Mike I’d talk to my mom to see if she could move it by a day. When I called her, she said the scheduler had given her the option of Sept. 24 or sometime in October, so obviously we can’t move the appointment. I was just about to call Mike back to tell him to cancel the plans, or to see if we could come home a day early, or I don’t know what, when he called me back to say he’d gotten the dates wrong and that we come back on Sept. 23, not the 24th, so nothing has to change at all: we can go on our trip and I can be here for my mom’s procedure! I have spent the days since then floating on air, dreaming about our trip. I have to get through two days of work and then we’ll be off to CDMX, as people call it these days. I can’t wait! Things have been insane since I last wrote. It’s really too much to go into in detail, but the short version is, my work team has been operating at 50% capacity after one employee left and another was out for a while so work has been extra busy; the house we bought needed a bunch of work; packing and moving all our stuff was a huge stressor; my mom was diagnosed with cancer and I’ve been taking her to a lot of medical appointments; and Michaela started third grade. The good news, in no particular order, is– our new house is lovely (and will be even nicer once we’re able to fully unpack once we install floors in the two bedrooms and two living rooms downstairs). It has a hot tub and I’ve taken a couple of soaks to relax and decompress. The kitchen, our bedroom and bathroom, and Michaela’s bedroom and bathroom are unpacked, so now we can function in our daily lives. On the work front, the employee who had been out came back today and the process is underway to hire a replacement for the person who left. Michaela is rocking third grade. Her teacher said she’s “a fantastic student and an incredible helper.” My mom is in good spirits, even if we don’t have a good sense yet of what her prognosis is. I’m trying to look on the bright side of things.